Note: There is no parking available. Take the Hibiya subway line and get off at Hiroo Station. Leave the station at Exit 1 and cross the pedestrian crossing. Go straight ahead between Kobeya Kitchen and Bank of Tokyo-Mitsubishi UFJ. Continue walking for about 50 meters, passing the open-air café. Then you will see Arisugawa-no-miya Memorial Park. Cross at the traffic light at Arisugawa-no-miya Memorial Park, and climb the Nanbuzaka slope between the park and the National Azabu Supermarket. While looking at the park on your left, continue walking in front of the German Embassy. 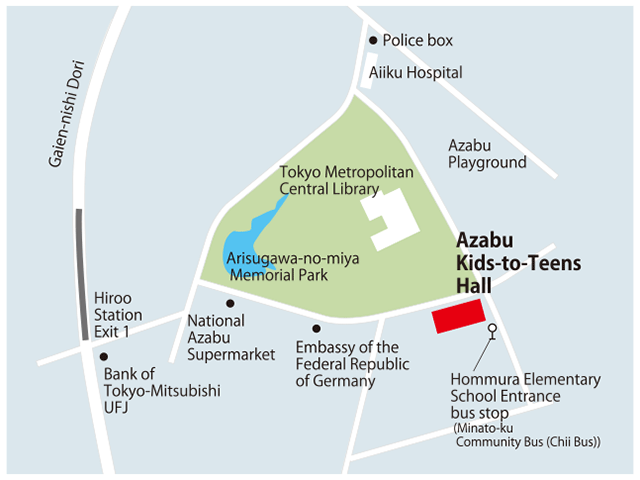 Azabu Kids-to-Teens Hall is on the right side when you’ve finished climbing the slope.